iDress for Weather is an app that helps you plan out a temperature appropriate outfit so that you do not end up 20 miles from your house in a dress and sandals during a torrential downpour. It was developed by Pebro Productions and costs $1.99. You can use this app on an iPhone, iPod Touch, and iPad. iDress is as simple as providing you with a weather forecast and a closet full of acceptable clothing that corresponds to that weather. When you open up the app it asks to use your current location and then gives you a weather estimate. You are not locked into your current location though, you can input any location you need anywhere in the world, and the app will give you the relevant weather forecast. There are two screens: One showing the weather and one showing a closet. On the weather screen you can use the i button to change the measurement from Fahrenheit to Celsius, customize the temperature levels, and turn extended info on and off. The purpose of customizing the temperature levels is to help the app determine what you consider Hot, Warm, Cool, Cold, Rainy, and Really Cold. Those six settings are attached to wardrobe images. The extended info includes humidity and wind levels. In the closet section there are six different categories that are listed above. Each of the six is assigned a set of clothing and shoes that fit the weather listed. 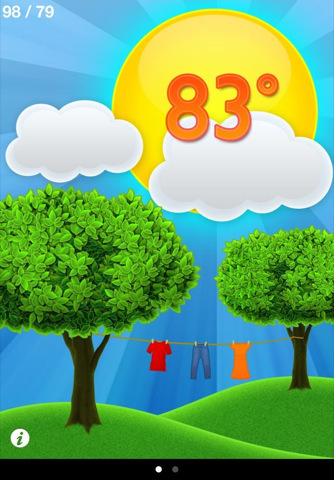 The app comes with graphics including shorts and sandals for Hot weather, and hats and mittens for Cold and Really Cold weather. You can take a picture or use one of your existing photos to customize the closet as well. The photo is then placed in the closet area and will show up when the weather calls for it. You have the option of resetting all the images back to the defaults if you want. I love this app. My favorite feature is that you can customize everything. Living in a city like LA where 73°F calls for a sweater and closed toe shoes, I like being able to set the wardrobe up so that I do not forget to dress accordingly. 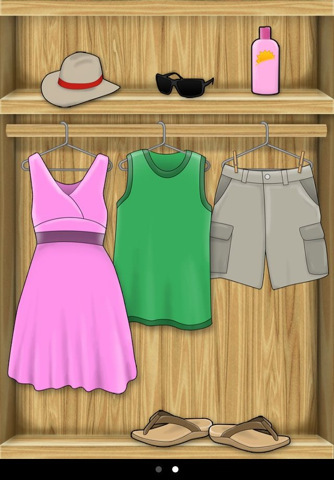 AppSafari review of iDress for Weather was written by Vanessa Paszterko on December 13th, 2010 and categorized under App Store, Fun, iPad apps, Productivity, Universal, Weather. Page viewed 4287 times, 2 so far today. Need help on using these apps? Please read the Help Page.